The Courts at the Oaks Tennis Club. The Oaks Tennis Club, situated on Oaks Road near to St James The Greater Church. We are a small and friendly club in a rural setting between Coalville, Shepshed and Loughborough, Leicestershire. 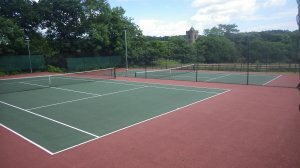 We have over 80 members who play on three very good courts, two of which have floodlights. There is a men's and ladies' team who play in the Leicestershire County Doubles Leagues and a thriving junior section which meets on Sunday mornings for coaching. For further details please see our website www.oakstennis.co.uk.The contact for the website is the Membership Secretary, Mrs Alison Whowell, telephone 01509 238008 or email Alison.whowell @btinternet.com. The club celebrated its 80th Anniversary in 2015. XHTML 1.0 validated. WCAG compliant. Page generated in 0.0623 seconds.